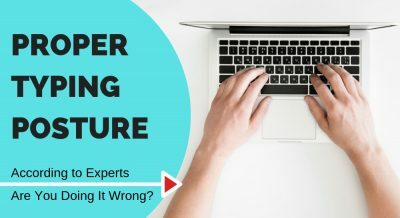 Picking an ergonomic office chair when you’re on a tight budget is fraught with potential pitfalls. Yes you may be saving money in the short term, but how long can you be assured the chair will last? Will it even be comfortable and ergonomic to use while it’s still working? 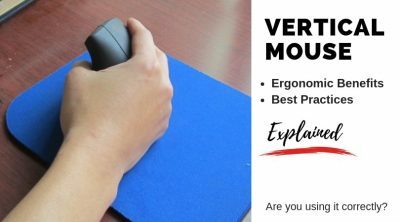 In this buyer’s guide we examine and review the very best ergonomic office chairs under $200. We do all the homework for you so you don’t have to, by picking only the highest quality budget chairs you can rest easy in. 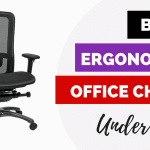 The office chairs that have made the list all have exceptional ergonomic features for their price, made of durable materials that won’t become a dead weight in a few months, and decent warranty to top it all off. 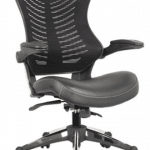 Which is the Best Ergonomic Chair under $200? Bottom line: Bi directional lumbar support, headrest, and rollerblade style castor wheels make this the best office chair in the $200 category. Yes the Duramont Office Chair does cost slightly over the prerequisite $200 or under theme of this guide, though I’d be remiss not to include it as part of my recommendations. 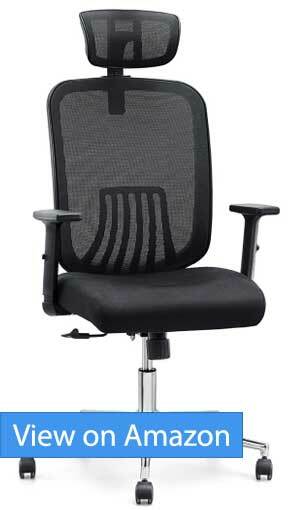 In fact, the Duramont is my pick for the very best ergonomic office chair you can get for around $200 dollars. Between the high quality metal frame, ultra thick seat cushion, and rollerblade style castor wheels you usually have to shell out $40 or more to purchase, this is a chair that you can easily expect to spend $300 or even $400 for. The gentle “s” shape of the backrest contours to the shape of your back. I love the lumbar support on the Duramont- both it’s height and firmness can be adjusted, with the later using a dial. One owner of the chair said the adjustable lumbar was so comfortable, he actually fell asleep in the chair shortly after sitting down. The backrest is made of breathable mesh, which will be appreciated for sure on hot sweaty days. The headrest on the Duramont is equally ergonomic, and can be angled to contour to the shape of your neck, besides being height adjustable. Combined with a backrest that reclines up to 120 degrees backwards and lockable, this chair can easily let you work, relax, and even take a quick nap in between. Rounding up the list of great features are the height adjustable armrest, plus thick cushions that shouldn’t sag after just a few months. A few users complained that the cushion is a little too firm, though for most people, this will be one of the most comfortable and ergonomic office chair you can get in the $200 price range. The 90 day unconditional money back guarantee doesn’t hurt either. Premium rollerblade castor wheels that glide over all types of surfaces easily. Bottom line: Robust lumbar support that provides excellent thoracic support to eliminate back pain. The Sihoo Ergonomics Office Chair comes with tensile strength mesh, a rotating headrest, and a comfortable seat cushion to create a decent all around office chair. Add a backrest that tilts back 125 degrees, with both the tilt angle and tension lockable, and you have a budget office chair under $200 that really lets you kick back when you need it. I really like how the reclining position of the back can be locked into place. This makes it a good chair not just for serious work (where I usually have it completely upright), but for watching movies (usually at a 15 degree angle), or even a quick nap, by reclining all the way back to its maximum 125 degree angle. 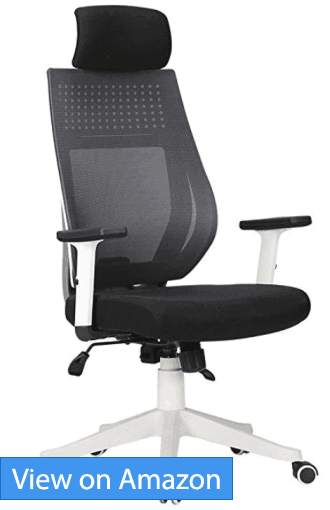 The lumbar support of the Sihoo Chair is similar to my #1 pick, the Duramont Office Chair, in that it is bi-directional. Move the lumbar up down 2 inches or inwards by 1.2 inches to support precisely the area of your back that needs it the most. One owner of the chair commented it’s such a relief to finally have a chair that doesn’t cause back and leg pain after long hours of sitting in it. With a robust back and headrest, waterfall shaped and cotton stuffed cushion and high quality castor wheels, the Sihoo Office Chair is an excellent ergonomic chair in it own right, budget or otherwise. Backrest that tilts back up to 125 degrees and can be locked anywhere in between. Bottom line: High end design meets excellent ergonomics in the Hbada Ergonomic Office Chair. The Hbada chair could easily be confused for a high end office chair, with its sleek contours and hefty seat frame. The chair is simply gorgeous to look at. And at under $200, it’s an incredible buy. The entire back and headrest of the Hbada is contoured to match the natural shape of the human body, providing long term comfort and excellent ergonomics. While the lumbar and headrest can’t be adjusted like some of the other chairs featured here, most people will find no adjustment is actually needed to feel right at home reclining into the chair. The seat on this ergonomic chair is large. The whole seating area is sturdy and there is an enlarged seat back. The cushion used in the seat is thick and provides additional comfort, particularly for larger users. 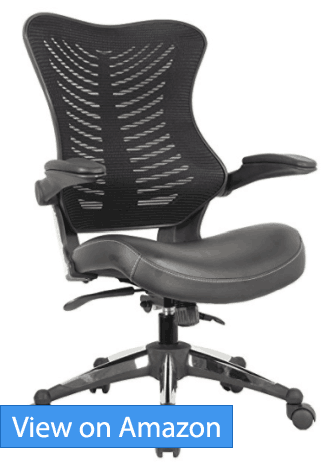 The mesh used on the Hbada Ergonomic Office Chair is breathable. 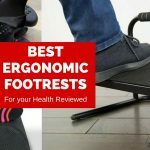 You will find that this provides a better experience when using the chair in the summer months. The mesh is very flexible and will adjust freely to the movement of your body. The versatile tilt mechanism on this ergonomic chair allows for maintaining the desired incline. 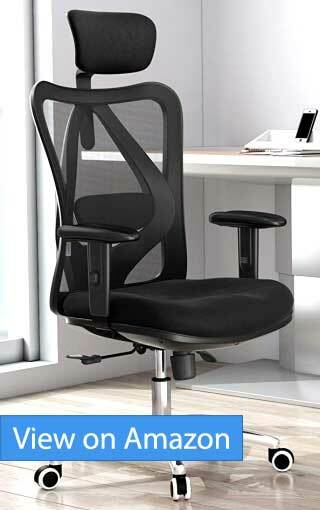 You can tilt the Hbada Ergonomic Office Chair from a straight up 90° to a lying back 150° position and lock it in place. And finally, the armrest are fully height adjustable, with soft PU leather covering them for comfort. The padding of the seat is also worth mentioning, with thick foam that is environmentally friendly. Overall an extremely stylish and well made chair, especially given its budget status. Lockable recline from 90 -150 degrees to maintain the desired tilt amount. Bottom line: If you find most office chairs too hard on your bottom or back, the Serta Works will blow your socks off. The Serta Works Executive Office Chair is an ultra plush, relaxing chair that will have your whole body sink into it in comfort. And it gets better. The lumbar area uses special air technology to create a back contouring zone that nestles and supports your lower back regardless of your body position. Serta calls it “adaptive lumbar support”. 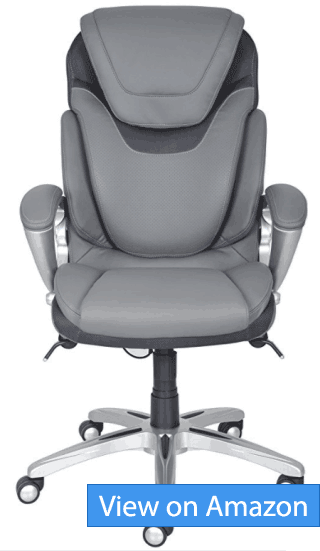 For people that often complain standard office chairs are too hard on their backs, the type of soft yet reactive lumbar found on the Serta Works offers an unique solution compared to other office chairs with the plush contouring lumbar. The chair is furnished in bonded leather, which is supple and comfortable. Combined with the hand sculpted holstered arms, and you can easily pass this chair off as a luxury item, despite the budget price. When it comes to adjustability, the Serta Works functions similarly to a regular office chair. The height and angle of the chair can be modified via a conveniently located side lever. The arm rest can also be heightened up to 29.25″ off the ground. For good mobility this chair is fitted with 60 mm castors. Serta claims that independent tests of the Serta Works shows users of the Serta Works find this chair more comfortable and ergonomic than competing chairs costing over $500. We have to agree, the Serta Works is extremely comfortable to sit in, with a cloud like feeling. Deep layered cushions and armrest for people that find standard office chairs too stiff for the bottom or back. Smooth bonded leather for a luxury, executive look. Limited ability to alter the back’s recline. Bonded leather not as durable as some other material, and may show signs of wear sooner. Bottom line: A well proportioned office chair with thick cushioned seat to cater to even people over 6 feet. 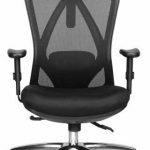 For a comfortable ergonomic office chair that works well even for tall users (such as one owner that measures 6’4″ and 200 lbs), the Cedric chair is a great choice. It has all the hallmarks of a great ergonomic chair, including a headrest that can be angled up to 60 degrees to fit the back of your head regardless of your posture. With a seat width and depth of 25.3” and 20” respectively, the Cedric chair is large enough to comfortably seat large users. The back of the chair is especially tall, extending 52.5” off the floor when you count the head rest. Even a few 6’4″ tall owners found the Cedric chair incredibly comfortable and sturdy, which can’t be said for many similar mesh chairs. 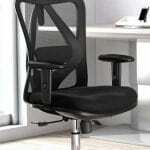 A common weak link of budget office chairs is the seat, which is often too thin and hence uncomfortable. Not the Cedric Chair, which comes with a 5.5cm thick cushion made of stretch fabric. It’s great to the touch and easy to clean. The height adjustable armrests are also padded all in the name of comfort. The one minor let down of the Cedric Chair is the lumbar support, which isn’t height adjustable. The wedge shaped support does work well for most people out of the box, flexing to support the lower back well. 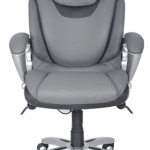 One user lauded how well the lumbar support relieved pressure from his spine. And with a 2 year limited warranty and great customer support, the Cedric Chair is a sure bet for under $200. Robust headrest that raises, lowers, and angles up to 60 degrees. 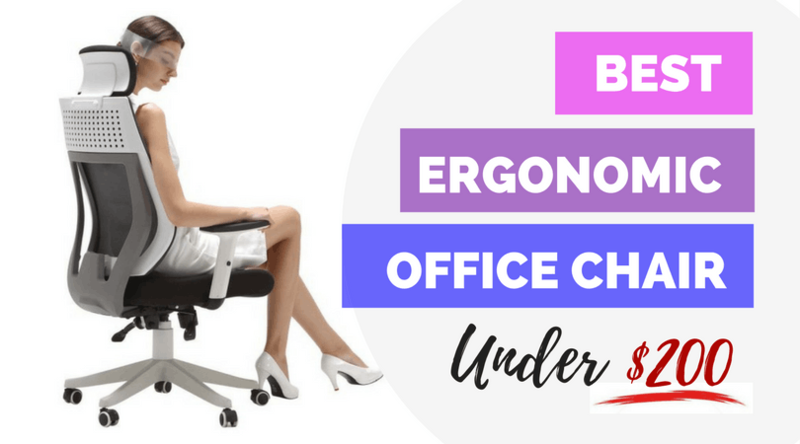 The Office Factor Executive Ergonomic Office Chair is a contemporary office chair that strives for minimalism while still remaining ergonomic and comfortable for long sessions of sitting. It weighs in at just 34 pounds and is one of the lightest ergonomic chairs that we have ever reviewed. A light chair makes it highly portable to move around from room to room at the drop of a dime. Gone is the headrest, which while in general we recommend, the fact is, not everyone uses it. Depending on the type of work you do, your upper body may frequently be leaning forward, making a headrest pointless. You know if you fall into that group if you’ve never missed the headrest on your existing chair. The two arm rests on the Office Factor Chair flip up for easy accessibility, and also makes it easy to use the chair to shuttle large things around. 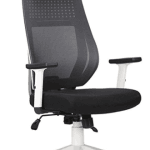 The back of the Office Factor Chair reclines with the seat, so your entire body tilts when you lean back. This is an usual design that at the end of the day functions no differently than back-only reclining chairs. We also can’t help but think this type of design with less moving parts will stand up to wear better over time. You are able to lock the back of this chair in any position that you want thanks to the double handle mechanism provided. This is a contemporary manager’s chair in black that has a 250 pound weight rating. The base of the chair is larger and provides for great stability. Double castors have now been included with this chair for better mobility. 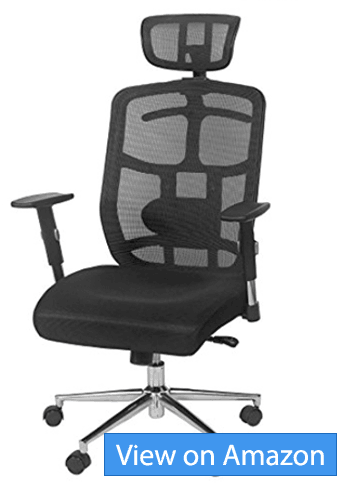 There is an improved gas lift mechanism for the Office Factor Executive Ergonomic Office Chair and this improves performance. The base and arms of this chair have chromed accents which look elegant. The mechanism to adjust this ergonomic chair is of high quality and there are two handles to operate it. You can adjust the angle of the seat back and then lock this in a position that is the most comfortable for you. 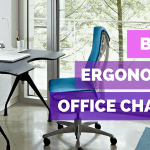 The Office Factor Executive Ergonomic Office Chair is a portable, durable ergonomic office chair that functions well in any setting. It is especially recommended as a secondary chair around the house. 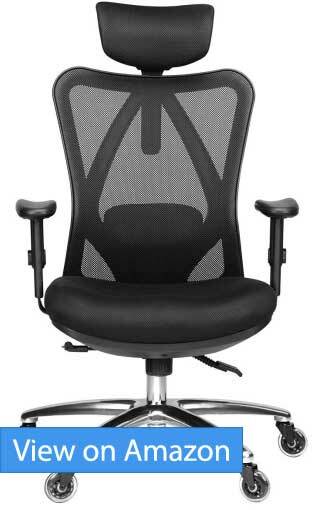 Bottom line: Well rounded office chair in the budget category, with adjustable head and arm rest covered in a mesh breathable material. Also comes with an unique hanger for clothes at the back. 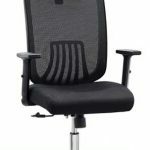 The Topsky Mesh Computer Ergonomic Chair with its sturdy back frame and high density mesh cover is a reliable bet for a great budget office chair. Despite this being a budget chair (under $200), the Topsky is surprisingly versatile from an ergonomic standpoint. It comes with a height adjustable 3D headrest that can be moved up or down depending on your height, and can also be angled. The lumbar support can be pushed inwards or outwards to contour to your back more precisely, a rare feature for a budget office chair. And finally, the thick 3.5″ armrest can also be moved up or down at the press of a button. The Topsky’s mesh cover helps regulate your temperature, and is especially appreciated during summer or after you’ve been sitting for hours on end. The seat cushion with padded foam feels relatively comfortable to sit on. This chair is 26 inches wide by 24 inches deep by up to 48.5 inches in height. It weighs in at just under 40 pounds. The Topsky office Chair offers excellent maneuverability, with the chair base and casters that swivel 360 degrees to move around effortlessly, even on carpet. We found the Topsky solidly built, with no unwanted creaking when sitting on it. The chair supports up to a maximum weight of 330 pounds, though the manufacturer recommends up to 220 pounds for prolonged longevity. The chair fully passes the BIFMA standards, which speaks to the overall quality of the chair. It comes with a 1 year warranty. Lastly, we’d be amiss not to mention the unique clothes hunger on the back of the Topsky chair. If you’re one to just toss your clothes around after you get home or arrive in the office, the hanger is a odd but welcomed addition. Our lifestyles now are particularly sedentary given our attachment to computers and other modern technology. Sitting in a chair for hours on end doing your work can lead to all kinds of health problems that you may not even be aware of. Lower back pain is one of the most common ailments in modern society. Can you afford $200 to greatly enhance your posture and decrease your chances of debilitating neck and back pain over time? Can you afford not to? The five ergonomic chairs chosen for this review are the cream of the pop when it comes to budget office chairs under $200. 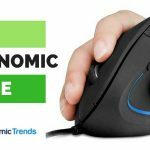 Many ergonomic chairs cost a lot more than that, some with inferior ergonomic features or durability than the five that made our list. 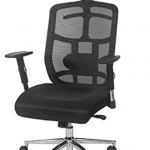 The Topsky Mesh office chair is an excellent all rounder with very few compromises for a budget chair. We loved the Hbada Ergonomic Office Chair for the cutting edge style that usually costs double or even triple its price tag. 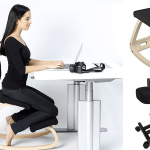 The Serta Works also offers unique benefits that people who find standard office chairs too hard on their back or bottom will really appreciate. Serta is one of the best chairs I have ever owned. I suffer from shoulder and mid-back pain and using this chair changed my life. I’m pretty sure that more companies will use air technology for lumbar support they have. It’s incredibly comfortable and adapts to my back beautifully. My only recommendation is to go with the brown colour rather than grey. I was reading this article to see if I should pick something different for a second chair, but happy to go with Serta again. I work in accounting and well, most of the time I end up sitting in front of the computer. I’ve been having nagging back pain for a while. A lot of people recommended that I get myself an ergonomic chair. Thankfully my office allowed me to get my own chair, so I’ve been on the lookout for one this week. I like the Hbada, and it’s well within my budget. However, I’ve always used chairs where the armrest adjusts independently of the back rest. I was wondering if having an armrest like the one in Hbada takes long to adjust or is uncomfortable? Nice list Jon, but I wish there were more non-mesh chairs in it. I’ve seen some excellent and cheap leather or padded back ones from Amazon for well under $200. Personally, I just picked up the Duramont Reclining Executive chair which has a nice recline, good ergonomic support and soft leather for under $200.